The Bronze Age of comics, typically considered the early ’70s through the mid ’80s, was a fascinating period that saw superheroes evolving while pulp genres regained popularity. Books like Conan The Barbarian, Master Of Kung Fu, and Swamp Thing brought epic fantasy, dynamic martial arts, and chilling horror to mainstream audiences. 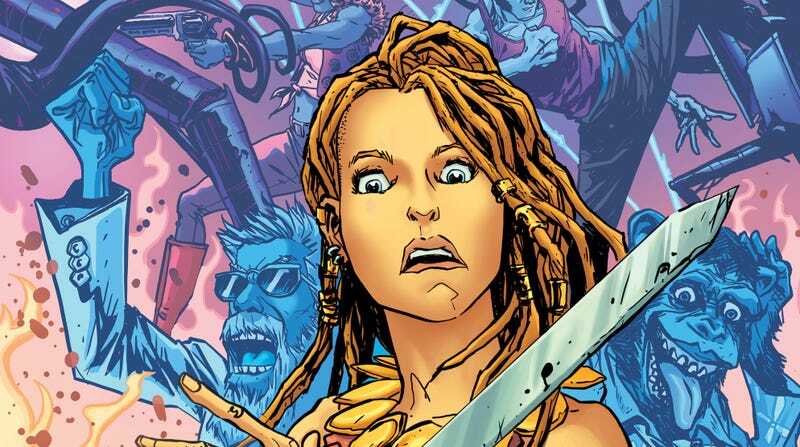 The new AHOY Comics series, Bronze Age Boogie, pays tribute to this time with its story of a barbarian princess fending off a Martian invasion in both 1975 AD and BC. Written by Stuart Moore with art by Alberto Ponticelli, colorist Giulia Brusco, and letterer Rob Steen, Bronze Age Boogie is a wacky genre mash-up that starts with a bang, throwing readers into a massive ancient conflict while steadily injecting strange new elements into the plot. Every AHOY issue is a “comic-book magazine” loaded with different backup content, and Bronze Age Boogie contains an additional short comic and two prose pieces to give readers extra bang for their buck. This exclusive preview of Bronze Age Boogie #1, on sale today, begins with fantasy spectacle as a barbarian army is forced to retreat from a mystical weapon. It then segues into a much quieter scene exploring the relationship between princess Brita and her father, which forms the book’s emotional core. Ponticelli and Brusco previously worked together on TKO Studios’ Venice Beach crime thriller, Goodnight Paradise, and this new series gives them new opportunities to go big as the story makes significant jumps in genre and tones. The sense of scale Ponticelli brings to the battle is very impressive, and he packs the spread with detail that Brusco matches in her vibrant, textured coloring. The atmosphere drastically changes when the story shifts to the tender father-daughter conversation, and Ponticelli hones in on character expressions while Brusco switches to a warm palette that eases the reader into the quiet scene after the explosive action that precedes it.